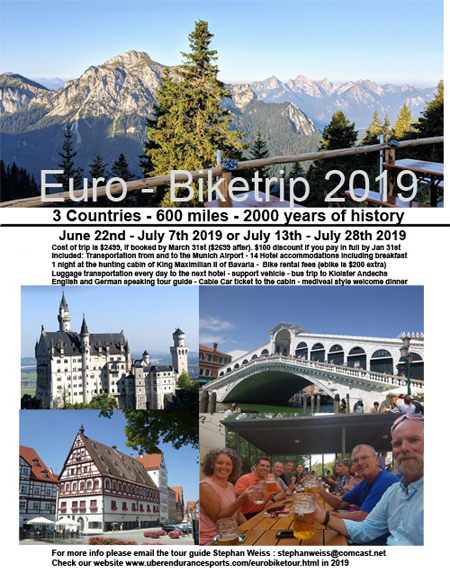 "Featuring a taste of Europe"
Travelling a foreign country on a bicycle is my favorite way to learn about the culture, the history and the way of life in that part of the world. Instead of seeing the country through a window, be it by bus, car or train, you are fully immersed in your suroundings. This summer we would like to invite you to an epic journey. 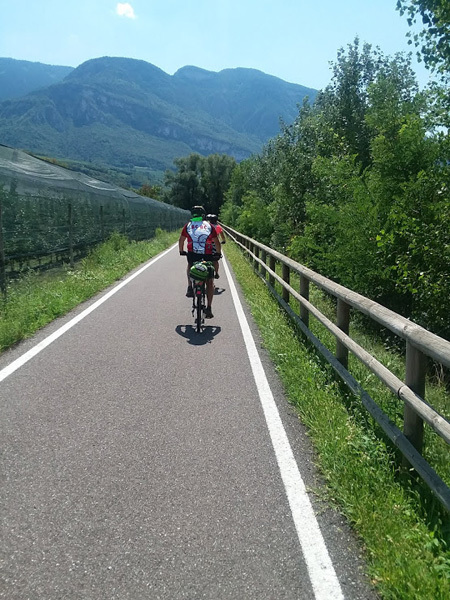 Travel by bicycle from Rottenburg o d Tauber, Germany across the Alps to Venice , Italy. approx 50 miles per day, 600 miles total. E-bikes are available to help you archieve your goal if you prefer. Over the course of 2 weeks, you get to experience 3 countries with all the history, beauty and culture. We take care of everything, all you need to bring is yourself, a suitcase and a bit of spending money for fun and food. - English and German speaking tour guide riding with the group the entire time (you know who that is going to be). Saturday, transfer from Munich Airport to Rottenburg ob der Tauber Germany. 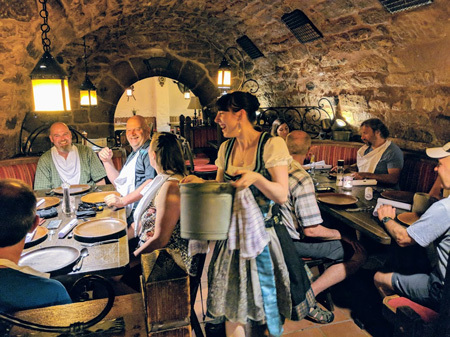 Spend the rest of the day in this medevial gem, walk the stone city wall surounding the entire historic center city and enjoy a romantic dinner in one of the many restaurants and beergardens. Receive your bicycle. 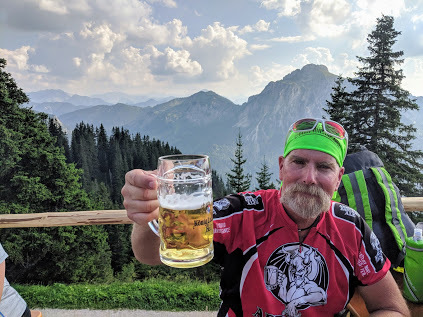 Bike 45 Miles to Dinkelsbuehl. Dinkelsbuehl has , what is considered Germany's most beautiful historic center city. Spend the late afternoon to explore the town, with all its historic building and churches. In the evening we invite you to a complementary medevial style dinner in an historic wine cellar. Bike to Donauwoerth. 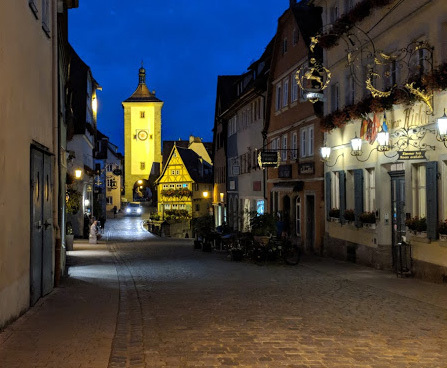 Another pretty town in Bavaria. Enjoy dinner with your partner, or stroll the town. 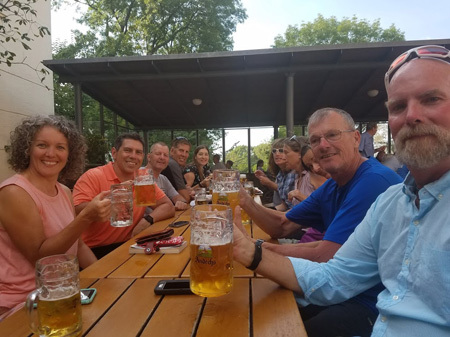 We bike to Augsburg. After Neuss and Trier, Augsburg is Germany's third oldest city, founded in 15 BC by the Romans as Augusta Vindelicorum, named after the Roman emperor Augustus. It was a Free Imperial City from 1276 to 1803 and the home of the patrician Fugger and Welser families that dominated European banking in the 16th century. The city played a leading role in the Reformation as the site of the 1530 Augsburg Confession and 1555 Peace of Augsburg. The Fuggerei, the oldest social housing complex in the world, was founded in 1513 by Jakob Fugger. Today Augsburg has approx 300000 residents. 45 miles to Hohenfurch. In the afternoon a bus (included) will get you to Kloister Andechs. Visit the church and sample their amazing beer and food at the beergarden. 35 miles to Fuessen. Definetely a highlight of the trip. A cable car will bring up on top of the Mount Tegel. Stay the night at the former hunting cabin of King Maximilian II, hike some trails on top of the mountain. Enjoy dinner with an amazing view. Rest day. Optional hike from the cabin down to Castle Neuschwanstein (or take the cable car). 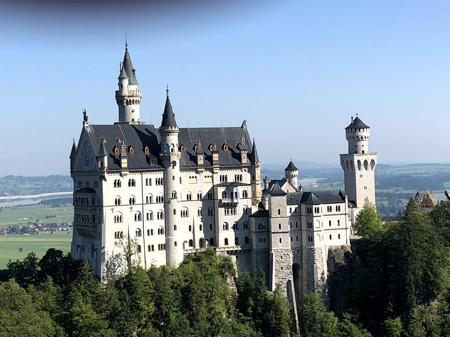 Spend the day in and around Fuessen to visit the famous castles and the downtown area. Crossing over the first mountain pass. Shuttle is available to bypass the pass. 30-45 miles. We end up in the nice alpine town of Imstl. Tackling another mountain pass. 30-45 miles. Shuttle available. We end up in the nice town of Reschen, home of the famous submergend church. This will also the highest elevation of the trip. 50 miles to Merano. Mostly downhill. Merano is well know for its warm climate and hot springs. Spend a relaxing evening at the Thermal spas (not included, approx $25). 40 miles to Castello Tesino. Train/busshuttle to get our of the city and pick up the trail. Castello Tesino is located near the Dolomite mountains. 45 miles to Castelbrando. Stay the night in this amazing 14th century castle. What an amazing location. Final leg of the trip. 60 miles of mostly flat and fast roads to Venice Italy. 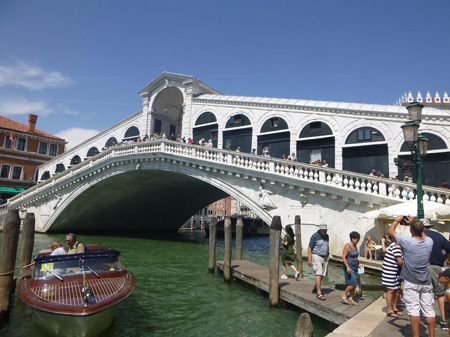 This leg can be shortened to 20 miles , so you have more time to spend in Venice. Spend the evening in Venice. Our hotel is just located a 5 min busride from the historic center city. Saturday.Spend another day in Venice. 6:00PM transfer back to Germany per night train in sleeper car with bunk beds. Sunday. Arrival at Munich Airport at 8:00AM. Flight back home.